Our AGM was held on Monday 15 October and we were delighted to be joined by Catalina Quiroz-Nino, visiting professor at York St John University. Catalina delivered a talk about the Peruvian Fair Trade Collective Cocla which has been working for over 50 years to improve the livelihoods of farmers and artisans across Peru, but especially in the mountainous regions which are more economically disadvantaged. The annual report was delivered. You can read the full text here. 2018 has been a great year for York Fair Trade Forum and 2019 will be our 15th anniversary as a Fairtrade City so keep an eye out for the fantastic events we have planned to celebrate. We were lucky enough to receive a visit from Howard and Webster, rice farmers from Malawi on Wednesday 19 September. The story of Kilombero rice starts with a remarkable act of faith. JTS were given a container of rice to sell, on the understanding that the rice would be paid for once it had been sold to UK customers. They were given free access to a warehouse in Paisley and started to figure out how to market the rice. They sold through fair trade shops, churches and schools and gradually the farmers were paid back with interest to invest in the better quality Kilombero rice seeds. Howard and Webster are both from Northern Malawi and represent around 7,000 rice farmers. Since they started working with JTS about ten years ago this has increased from 2,500. There are no plans to expand it any more until the demand for the rice increases, otherwise the farmers will stop seeing the benefits. The farmers work in small groups and elect officers who organise the sales and marketing of the rice. They hold each other to account for things being done on time. Both Howard and Webster – who are Chair and Vice Chair of one of the regional co-operatives – believe it is this collective organisation and the structure of the co-operative that makes them efficient and successful. Most of the investment into the collective comes from government funds, from both Scottish and Norwegian governments but since public opinion is turning against “foreign aid” it’s vital that the farmers are able to compete on a level playing field. John Riches of JTS reckons that a £250,000 one-off investment would be enough to put the farmers in a position to be self-sustaining. The farmers have always been rice farmers on a subsistence level, but those outside the fair trade system often don’t have enough money to feed themselves and their families. The big improvement in their productivity was the introduction of Kilombero rice seeds. Each farmer was given 20kg of rice and tasked with doubling it in two years. This was achieved and now they have enough to sell and make a profit as well as feeding their families. The two main technological changes they are taking on board to maximise productivity are ox carts and threshing machines. The ox carts mean they don’t have to transport their rice from their field to the marketing hub in individual 50kg sacks but can take several at once. The threshing is currently done by hand but Howard is working with an engineer from Dumfries to develop a lightweight mechanical threshing machine to save labour. He hopes to have this up and running within a couple of years. 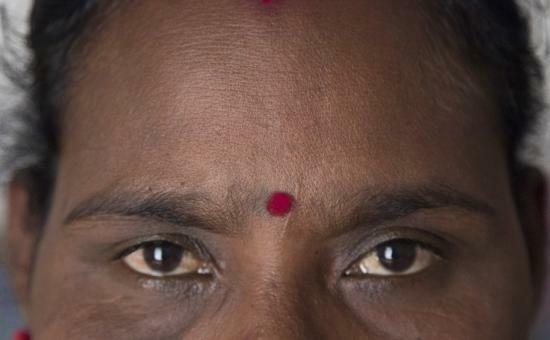 Two thirds of the farmers are women, mostly widows. In Malawi there are lots of women who are colloquially known as widows but whose husbands have left them and engaged in polygamy. They are responsible for feeding and looking after anything up to eight children. All the farm work is done by hand – when they saw Scottish farmers they said they weren’t farmers, they were machine operators. They were, however, astounded at how quickly tractors and modern farm machinery can work. Fields that would take them three weeks to plough manually, can be ploughed in a day. Another important tool is ploughs. Lots of the very poorest farmers don’t have their own ploughs so they have to pay someone who does have a plough £30 every year before they can plant their rice. Most of these poorest farmers are women so there is an initiative called “A ploughwoman’s dinner” where women get together for a meal at someone’s house, using Kilombero rice, and donate what that meal would have cost them in a restaurant to help a Malawian woman afford a plough. Since ploughs cost around £100 it’s likely that as few as 4 or 5 women doing this would be able to buy a plough for a Malawian woman farmer. One of the attendees said that she had visited Malawi on an initiative from the Bishops of Malawi to support primary school children, especially getting girls to stay in primary school. The farmers agreed that education was vitally important especially for girls and that one of the things they have done with the support of JTS is to pay the school fees of children who have been orphaned due to HIV/AIDS. Some of these children have been able to get to university and the continuous support of JTS has meant that the fees have continued to be paid right through to university. The 90kg challenge is an initiative designed to help market the rice to community groups such as schools and churches. It was based on the best guess of one of the farmers who was asked how much he was paying to educate his children and how much rice that equated to, but it has been extremely successful in getting children into school and helping them fulfil their potential. The forum held stalls over the summer at York Pride and the Woodthorpe Family Day. These give us a great opportunity to talk to members of the public and promote the work of the forum in the city and the benefits of fair trade. 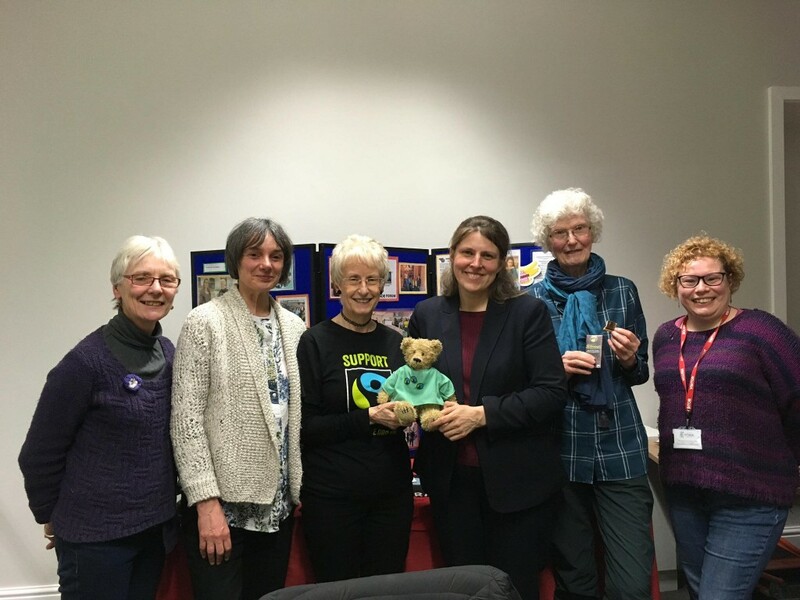 On Tuesday 10 April we were delighted to welcome Rachael Maskell the MP for York Central who talked to the group about her commitment to fair trade and ideas to progress trade justice in York. We discussed the recent changes at Sainsbury’s, fair and ethical trade deals in a post-Brexit UK and the sustainable development goals. We would like to thank Rachael for being so generous with her time, and look forward to moving forward with her ideas. Our main event in Fairtrade Fortnight 2018 was a Business Breakfast meeting at Spurriergate Centre on Tuesday 6 March. We invited local business people, councillors and other interested parties to “Come on in” for free Fairtrade tea, coffee and juice, fruit and toast with fair trade jams and spreads. 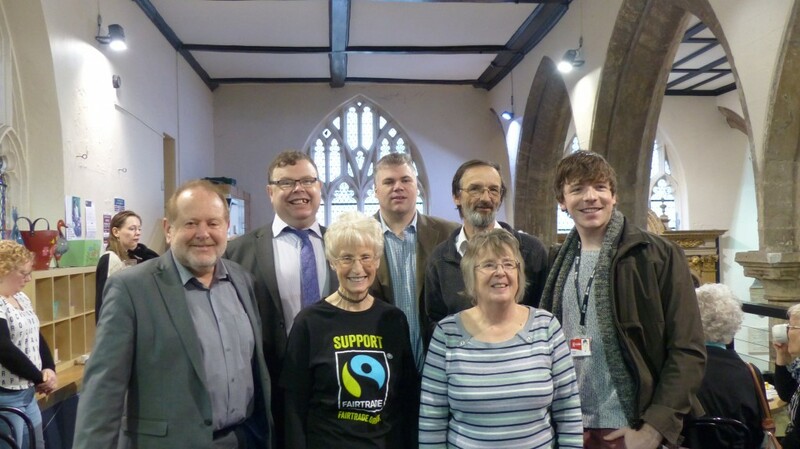 The event was really well attended, with at least ten councillors in attendance and some really interesting conversations about the role of fair trade in combating global poverty. York Press was on hand to cover the event. You can see their write-up here. We were excited to welcome That’s York TV to the event as well, and their interview with group member Joanna was broadcast later that evening. The piece is now available on their You Tube channel. We would like to thank the staff and volunteers at the Spurriergate Centre who did a great job of hosting the event, the Co-op who provided Fairtrade bananas and Fairer World who provided some of the more unusual jams from their Swazi Kitchen range. This was one of the most popular events we have ever held, and we hope to repeat the event next year – our 15th anniversary as a Fair Trade City – so keep your eye out for details and come along in 2019. As part of our work we promote Fair Trade by hosting visits by Fair Trade producers and suppliers. One such visit was from Sam Magona, a coffee farmer from the Gumutindo Fairtrade Coffee Cooperative in Uganda. Gumutindo produces very high quality coffee. Sam stressed the benefits that Fairtrade has brought to the cooperative. They receive a stable, guaranteed price for their coffee. This is crucial as the coffee market is particularly prone to fluctuations. Price crashes in the market have resulted in mass poverty for many coffee farmers who don’t have access to Fairtrade markets. Higher prices paid to the farmers have enabled Gumutindo to build up their business, investing in infrastructure and training. The extra payment has also enabled the farmers to pay for thetraining and certification costs to produce organic certified coffee – better for the environment and a new market for the producers. The coop has also been able to build stores for their coffee and a cupping lab so that the farmers can taste their own coffee – a new experience for many. Sam is the Chairman and one of the driving forces behind Gumutindo. He is a very active figure in his own community. We found him a lively and inspirational figure. We were asked to guess his age and were all wide of the mark by a long way. He refused to reveal his secret in looking so young and dynamic. In 2010 we hosted a visit from Nioka Abbott, a banana farmer from the Windward Islands. 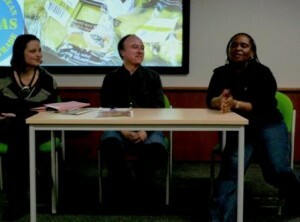 As well as visiting the Fair trade Market and other festival events, Nioka spoke at a public meeting at York St. John University. She told us how important the Fairtrade movement has been in supporting small scale farming in the Caribbean. In the face of enormous political and commercial opposition from the large trading blocks, Fairtrade has continued to provide a valuable market for small scale farmers. As part of the Fair Trade Movement, we often have the opportunity to share with international partners. 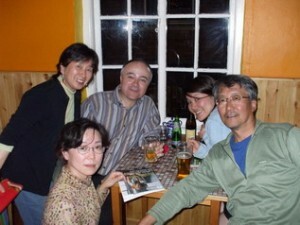 On several occasions in recent years we have been honoured to welcome parties of fair trade supporters, and academics, from Japan. Fair Trade in Japan hasn’t yet reached the level it is at in Britain, however sales are accelerating rapidly. 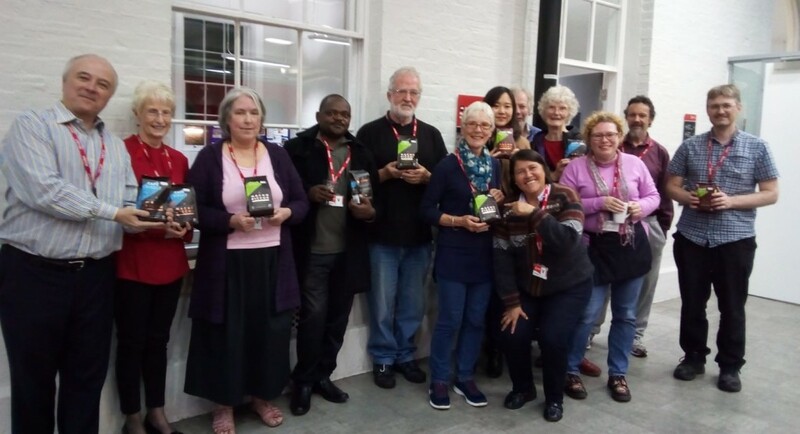 Activists in several Japanese cities, including Tokyo, Osaka and Kyoto, are interested in working towards Fairtrade City status and our visitors are always eager to hear about our experiences in York. On two occasions now we have welcomed the activist, Yuki Sato. She’s a dynamic figure and a long term supporter of fair trade. We have also welcomed Kobuki Takeshi who is the Secretary general of Samasama, a large fair trade organisation. Most recently we have recieved a visit from Professor Ishikawa, from the Kyoto University of Education, who is conducting research into the feasibility of a large scale roll out of fair trade. They are all hoping the fair trade will be taken into the mainstream in Japan. There is obviously enormous potential. 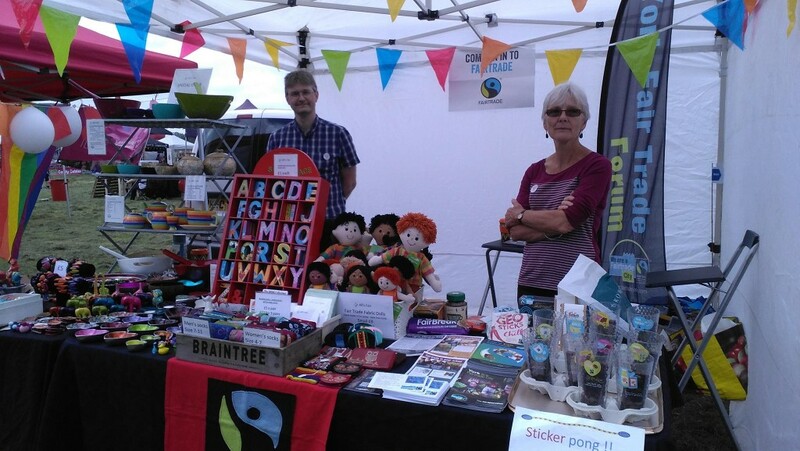 Throughout the year, the Forum holds events and information stalls to promote Fair Trade and highlight the range and quality of Fair Trade products that are available. Fairtrade wine tasting One such event was a Fairtrade wine tasting that was held at the Guildhall.We were given a tutored tasting by the wine expert Gareth Morgan. Gareth is a member of the Association of Wine Educators and a keen supporter of Fairtrade wines. We were delighted to welcome a surprise guest, Rugby League star, Peter Fox. 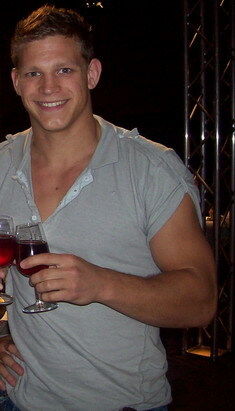 He very much appreciated the range of Fairtrade wines that we tasted. You should be able to find them at Co-op, M & S and major supermarkets. The Fair Trade Forum’s remit includes supporting local Fair Trade businesses. We are very fortunate in York that there a good number of retailers who carry a range of fairly traded goods and many cafes that serve Fairtrade food and drink. 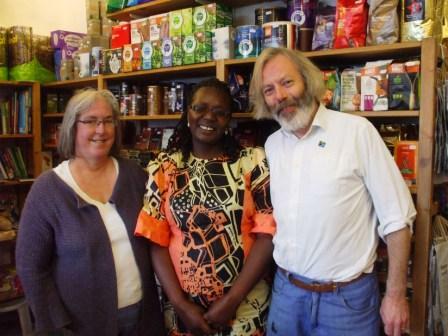 The photo features the visit to the Fairer World shop in Gillygate of Traidcraft tea farmer, Patricia Mtangeli, who is widely known as Mama Fairtrade. Fairer World shop carry the largest range of Fair Trade goods in York – well worth checking out. The Forum also lobbies those in power to call for better working conditions and fairer pay for workers in the world’s poorest countries. We speak to local and national politicians, large private corporations and also faith leaders. 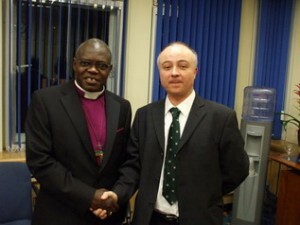 We were delighted that the Archbishop of York, Dr John Sentamu gave his unequivocal backing for fair trade. He called on consumers to buy fair trade products and asked large corporations to consider the way they treat the producers on whose produce they depend. York Fair Trade Forum helps to publicise Fair Trade by working with the media. 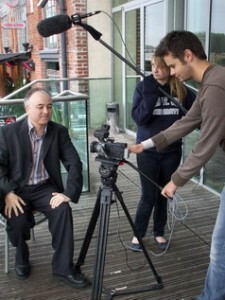 As well as the York Press and local radio, we like to explore different angles including York’s student media. 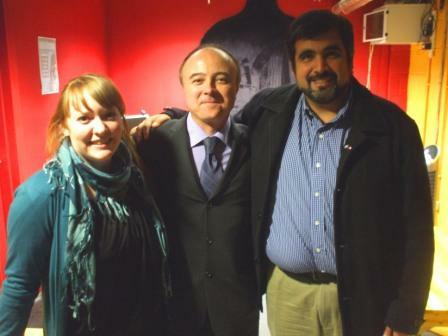 Ruth from Shared Interest, Mark of York Fair Trade Forum & Hugo Villela. 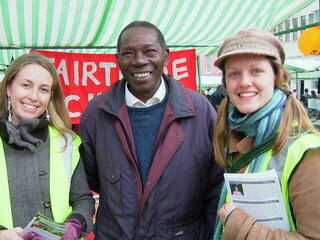 York Fair Trade Forum works with many like-minded organisations. One important partner is the Fair Trade finance company, Shared Interest, who provide loans to Fair Trade producers and suppliers. It is easy to invest in Shared Interest &, as well as providing vital investment for small scale producers, their financial track record is a great deal more impressive than many of the large banks. Hugo Villela is based in Costa Rica & looks after Shared Interest’s producer clients in Central America. He came to speak to us in York at an exciting event at the City Screen. Click on the link here to find out more about Shared Interest. 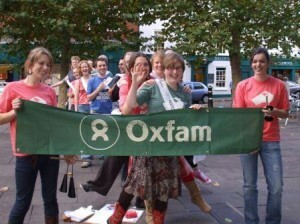 A local organisation we work closely with is the York branch of Oxfam Campaigns.Oxfam speaks out on many trade issues. We are currently supporting the Oxfam food campaign, Grow. Grow has identified 4 issues to address to help fix the broken system – The impact of climate change – Food price fluctuation – Land grabs – The need to support small scale farming. Find out more about Grow here. Check out the Oxfam website. 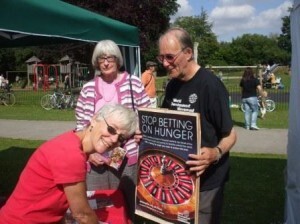 The group Just York campaign on international development & global finance issues.In the photo are members of the group supporting the World Development Movement’s campaign on food speculation. Speculation on food prices by large financial institutions has increased price fluctuations. This works to the detriment of producers, particularly small scale farmers in the world’s poorest countries. Click on the link to the Just York website.